Finpari offers a useful educational package, trade pattern ideas, expert commentary, market news, fundamental analysis, and technical analysis. 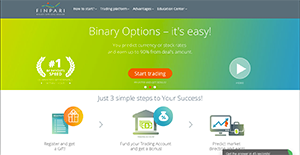 This broker’s Education Center can help new traders learn the basics of binary options traders while more experienced traders can use it to boost their existing knowledge. Finpari’s website is easy to navigate with eye-catching design and contains helpful information to help you get started. Finpari offers 24/7 customer support. It is crucial to keep in mind that almost no service in the Binary Options Brokers category is going to be a perfect solution able to match all the goals of various investors. It may be a good idea to read a few Finpari reviews first as specific solutions can actually perform well just in a specific geography or situation or be designed with a really specific customer in mind. Others may work with an intention of being easy and intuitive and consequently lack complicated elements needed by more experienced users. You can also come across services that support a broad group of customers and provide a complex feature set, however that frequently comes at a higher price of such a solution. Ensure you're aware of your requirements so that you choose a service that has specifically the elements you search for. We realize that when you make a decision to buy Binary Options Brokers it’s important not only to see how experts evaluate it in their reviews, but also to find out if the real people and companies that buy it are actually satisfied with the product. That’s why we’ve created our behavior-based Customer Satisfaction Algorithm™ that gathers customer reviews, comments and Finpari reviews across a wide range of social media sites. The data is then presented in an easy to digest form showing how many people had positive and negative experience with Finpari. With that information at hand you should be equipped to make an informed buying decision that you won’t regret. What Bonus Does Finpari Offer? The bonus will be paid in your chosen currency. The maximum bonus that is awarded during any year to is €/$ 100,000. Finpari is a new entry in the binary brokers market, but the level of service this firm extends to its clients is as good as established companies in the business. Finpari provides clients a number of tradable assets including currencies, stocks, commodities, and indices, plus a range of option types that can suit all types of traders. If you need more information about Finpari or you simply have a question let us know what you need and we’ll forward your request directly to the vendor.